I am doing taking part in blogmas, just like last year, there will be a new post everyday until the 25th of December. Can't wait to share with you all the exciting posts! 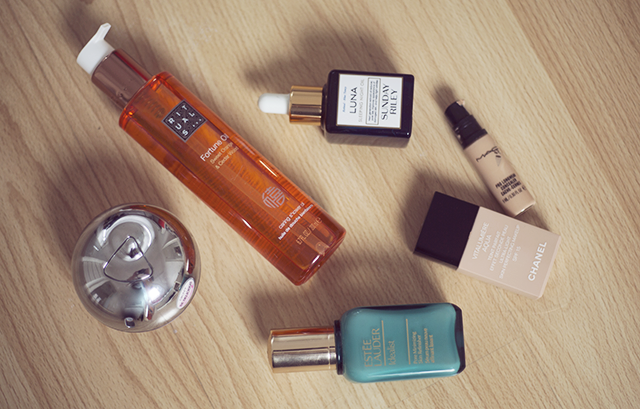 Let's get on with November favourites, I've fallen in love with oils. During colder months my skin tends to get more drier, so moisturising is a must. Whilst browsing in Fenwick I came across the Rituals Fortune Oil in Sweet Orange and Cedar, I was sold as soon as I gave it a sniff. This is a shower oil, sadly the scent doesn't last on the skin too long, but my skin feels well moisturised after shower. DKNY Be Delicious Fresh Blossom is one of my favorite perfume at the moment, its very fresh, although it's more of an light summer scent, I prefer to use the perfume more during the winter time. OMG! Sunday Riley Luna Night Oil is the bomb! At first I thought it's over hyped by the bloggers, but to be honest this oil does wonders to the skin, will soon post a full review. Chanel Vitalumiere Aqua Foundation always have been my fav, I recently started to mix it with the MAC Pro Longwear Concealer and my oh my, the foundation now has perfect coverage and lasting power. I love to applying the combo with BeautyBlender. One of my favourite under cream base is the Estee Lauder Idealist Pore Minimizng Skin Refinisher, leaves the skin so smooth. You apply it before your cream, I don't have the largest pores, but this does help to cover them up! What are your recent favourites? Have you tried anything mention above? I love the Pro longwear concealer too! I've recently been using UD Naked concealer and its SO good!